Recently I put out two games, The Chaotic Workshop and Pew Zoom Boom, which both have with a free ad supported version. There’s lots of support and examples for native code, but to get them working with MonoGame and Xamarin in C# took a bit of searching through Forums and trial and error to get it working across all platforms. What I opted for was a single AdManager class which which encapsulated everything needed for loading and showing ads for any and all platforms. 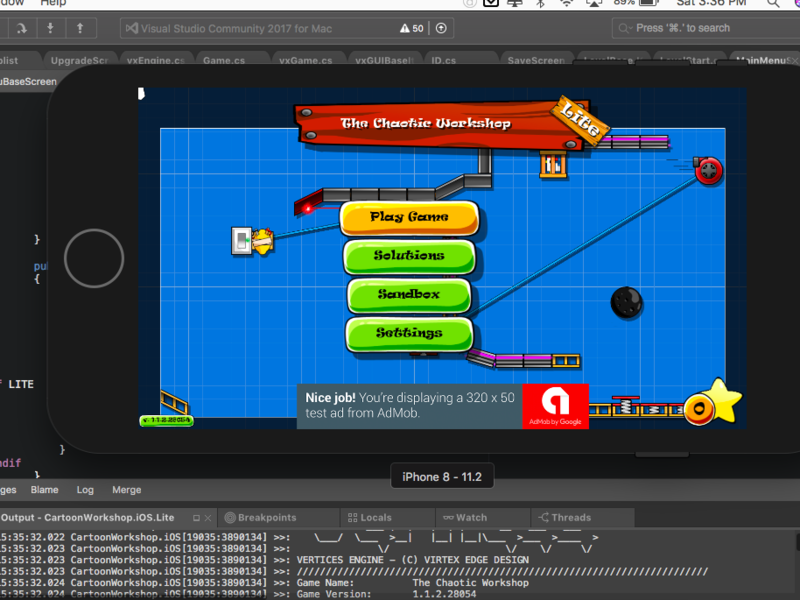 A Banner Test Ad showing in The Chaotic Workshop on iOS. First, since the ads would be shown overtop of the game view, it was required to set up the platform specific Views which would hold the ads themselves. As you can see below, iOS is rather straightforward, but for Android, the constructor is a little more involved. We need to get the GameView, as well as create an AdContainer, and then place both of them into the original mainview. This AdContainer is for the BannerAd that we’ll add later. /// Initialise a new AdMob Ad Overlay. This is a Cross platform method which will run on both Android and iOS. Banner ads are great because they provide ads while, if designed properly, shouldn’t impede the players enjoyment of the game. Below here is how the Banner Ads are set up. // Add the banner view to the AdContainer. Here we place the BannerAd as well as pass the Adunit ID from Admob. Once we’ve set up the BannerAd Views for each platform, we need to then tell the banner ad view to load ads. This is done differently is each platform. Note: it’s really important you use TestDevice IDs as well as Googles test adunit ID, so that you don’t pick up false impressions and also so AdMob doesn’t ban you! This method has seemed to be working for me, but double check on your own system. There’s no need to call a Show() method or anything, it will start showing banner ads as soon as some are loaded. 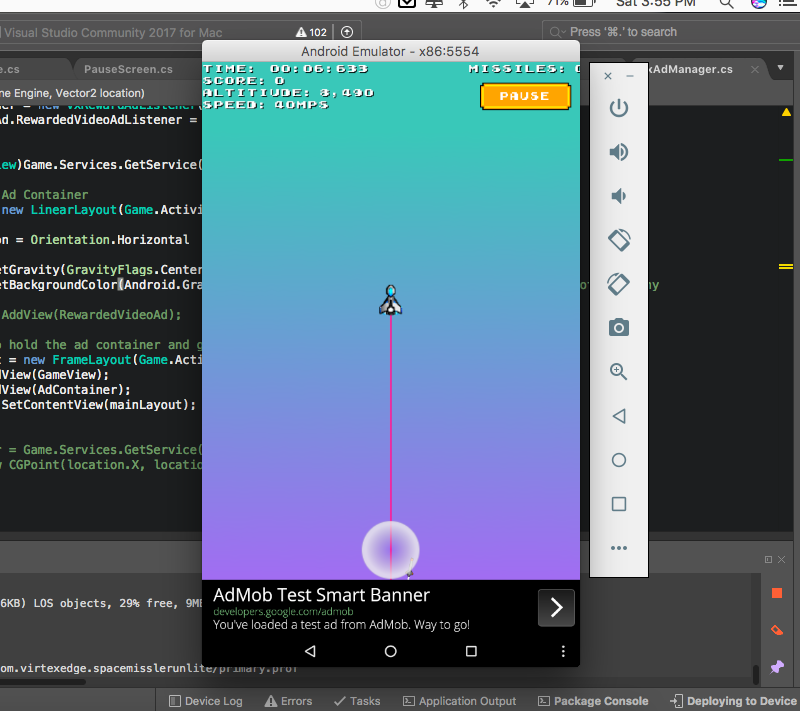 Below you can see a version of the test ad working in Pew Zoom Boom on Android. Intersitital Ads are good to show during transitions in your game, such as between levels or during a game over. We use them in The Chaotic Workshop and Pew Zoom Boom at the end of every other level. First job is to Initialise the Interstitial Ads. /// Adds the initerstialel ad. // the ad's are loaded. Note: for iOS this is handled very differently. Each time you show an Interstitial Ad, you need to instantiate the InterestitialAd object. Otherwise it will throw errors. The way i’ve set it up is this is done each time ‘LoadIniterstialelAd’ is called. Much the same way banner ads are handled, here we create a request object and then load the ad. For Interstitial Ads though, you need to check if an ad has been loaded yet before showing it. Note how we call ‘AdViewInterstitial = new Interstitial(this.AdUnitID);’ here for iOS. As I said before, you need to Re-instantiate the ‘Interstitial’ object each time you want to load an ad. We’re now ready to show the ads. The Android Interstitial Ad object is instantiated in the constructor, and therefore the only check is for whether there is an ad loaded. For iOS, since the ‘Interstitial’ object is re-instantiated each time we call it, we need to do a few more checks, but the method is essentially the same. /// Shows the initersial ad if there's one loaded. One other thing to be aware of, in Android, when the Interstitial Ads are shown, the game is paused, where as in iOS the game continues to run. It’s important to set up a method where the game is paused until the Interstitial Ad is closed. So there you go. You can get a copy of the full AdManager here. If you like what you read, give me a follow, or keep up with me on Twitter.